HMS Adamant was a launched by Cammell Laird on the 12th July 1911 and sold in 1932. Adamant served with the Eighth Submarine Flotilla at Harwich in 1914 and 1915. She later worked with submarines in the Mediterranean. HMS Audacious was ordered on 29 April 1867 from Robert Napier in Govan, Glasgow. She was laid down on 26 June 1867 and launched on 27 February 1869. The ship was completed on 10 September 1870 and commissioned the following month. Upon completion she became guard ship of the First Reserve at Kingstown, Ireland, but was transferred the following year to Hull where she remained until 1874. The ship was ordered to the Far East that year to serve as the flagship for the China Station under the flag of Vice-Admiral Sir Alfred Phillips Ryder. Despite the presence of escorting tugs, Audacious grounded twice while she was transiting through the Suez Canal. 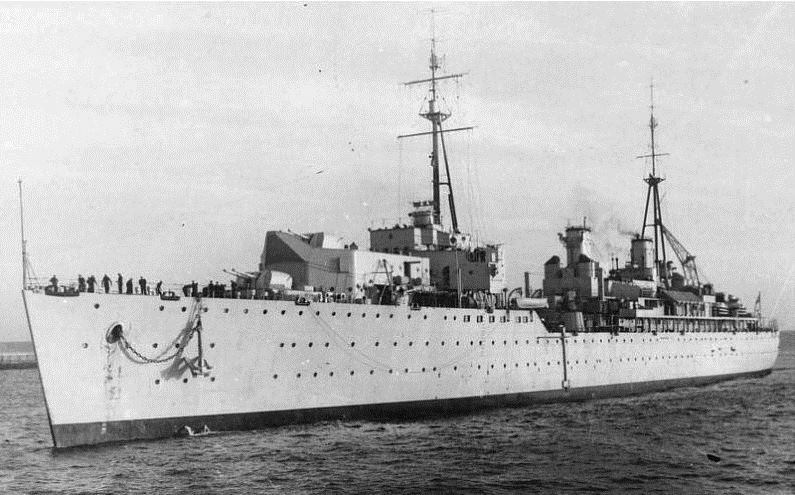 She relieved her sister Iron Duke in Singapore, and later collided with a merchant ship during a typhoon in Yokohama. 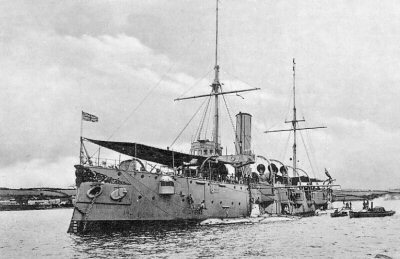 Iron Duke relieved her in turn in 1878. 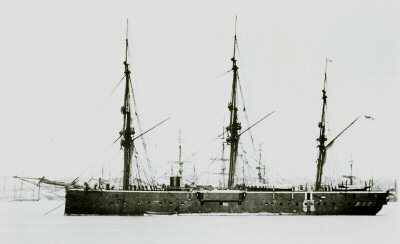 Audacious returned to her previous post in Hull in 1879, relieving HMS Endymion. She served there until she began a lengthy refit which included new boilers and the addition of a poop deck. On the 16th August 1903 H.M.S. Audacious arrived from Chatham to become the new depot ship for destroyers until 1905. In 1906, she was recomissioned as part of the four-ship Fisgard boy artificers training establishment at Portsmouth. The ship was towed to Scapa Flow in 1914 after the start of the First World War to be used as a receiving ship and was renamed Imperieuse. In 1919 she was to be renamed Victorious, but the renaming was cancelled. She was towed from Scapa to Rosyth on 31 March 1920, where she remained as storeship until 15 March 1927, when sold to Ward of Inverkeithing for scrap. 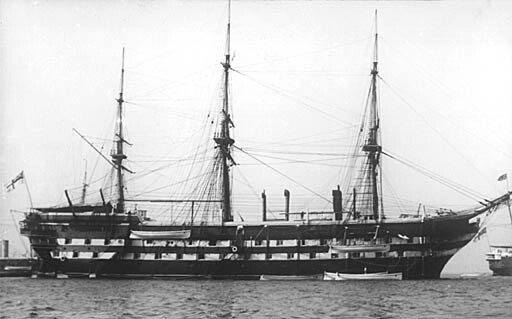 HMS Agincourt, named after the victory at the Battle of Agincourt in 1415, was originally ordered on 2 September 1861 as HMS Captain, but her name was changed during construction. She was laid down on 30 October 1861 by Laird’s at its shipyard in Birkenhead. The ship was launched on 27 March 1865, commissioned in June 1868 for sea trials and completed on 19 December. Agincourt was renamed Boscawen III and served twelve years at Portland. In 1905 she was moved to Harwich and renamed as Ganges II. After four years at Harwich, Ganges II made her final journey, to Sheerness, in 1909. HMS Elfin was a Submarine Depot Ship, formerly the War Department vessel Dundas, transferred to the Royal Navy in 1905 and sold in 1928. About 7 o’clock on the 16th December 1910, while it was still dark and a gale was blowing Elfin was leaving Harwich Harbour when she came into collision with the submarine C8, which was bound for Felixstowe to renew petrol. The Elfin, which had some 20 or 30 seamen, who were being taken to the Thames, on board, was struck under water and went down within seven minutes. 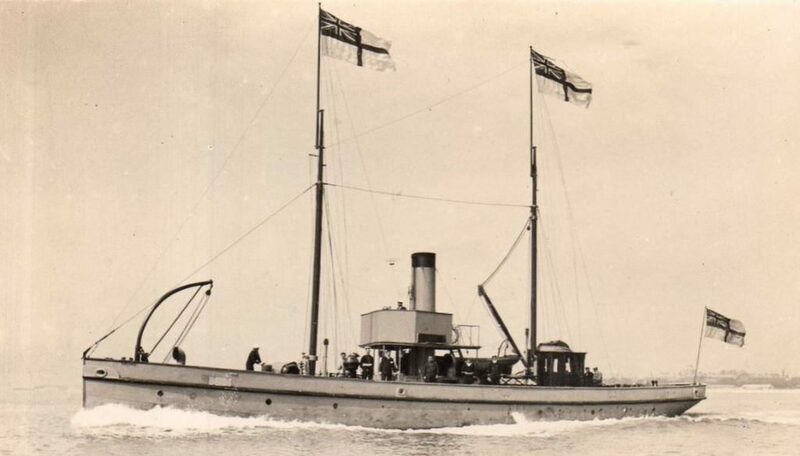 The submarine and other vessels, including the barge Swan, of Mistley, succeeded in rescuing all the men, with the exception of the five who are missing. 27/10/1910. Divers have recovered the bodies of Richard Millard, A.B. ; Nicholas Morgan, leading stoker, and John George Stevens, who perished when the Elfin sank at Harwich after being damaged in collision with Submarine C8. The bodies were found on the mess deck, the collision having cut off the means of exit to the upper deck. It is expected that the Elfin will be beached in a few days, when the spring tides will permit of operations being resumed. The bodies of Walter Sharp and James Bain are still missing, and are not on the Elfin. Elfin was raised and returned to service until 1928 when she was scrapped. HMS Maidstone was Submarine Depot Ship, built by Scott’s of Greenock and Launched on the 29 April 1912. she was sold for Scrapping on the 31st August 1932. HMS Onyx was an Alarm class torpedo gunboat launched in 1892. Onyx became a depot ship in 1907, and was renamed HMS Vulcan II in 1919 then was sold in 1924. 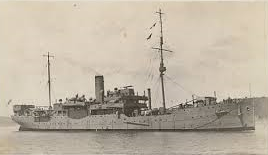 HMS Seymour was launched by Cammell Laird on the 31st August 1916 Parker Class Flotilla Leader she was converted to a minelayer after completion and sold for scrapping in January 1930. Launched at the shipyard of Furness Withy Co. Ltd., West Hartlepool with yard number 307, on 21 November 1907 for the Hamburg Amerikanische Packetfahrt AG, Hamburg, Germany.. Pennant in January 1918 P.2A and during the Second World War F27. With a displacement of 5.805 tons. 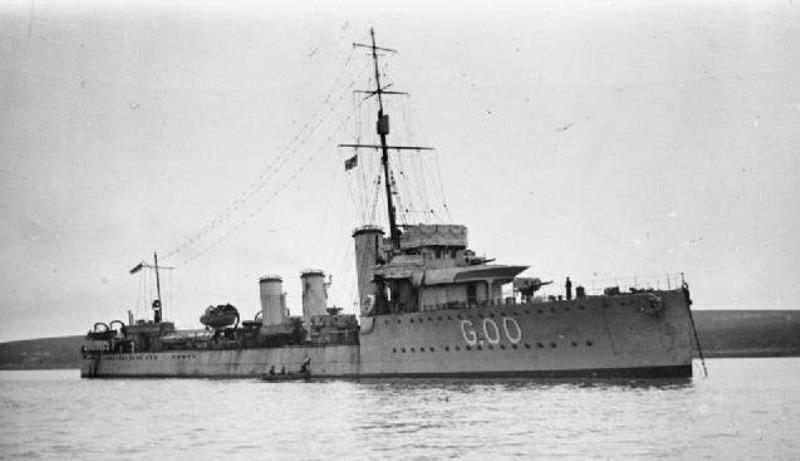 Her crew numbered 262 men and her speed was 12,75 knots. Captured in 1914 and after conversion into a submarine depot ship was she commissioned in the Royal British navy in 1916. In the Second World War was she classified as repair ship. On 4 September 1946 sold to the Cia. Maritime Geojunior, Panama, renamed Sinain 1948, a year later laid up and finally broken up at La Spezia, Italy in 1951. HMS Thames was completed in 1888 as one of four second class protected Cruisers of the Mersey class, but served in the war as a Submarine Depot ship from 1914 at Harwich, Thames was launched on the 3rd of December 1885 by Pembroke Dockyard and sold to South Africa in 1920. 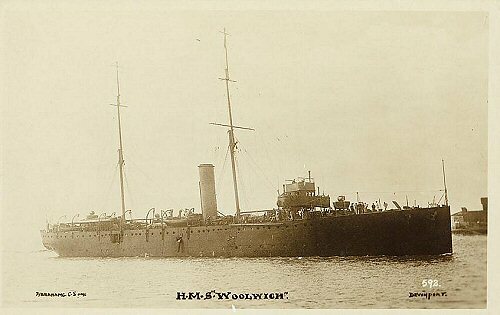 HMS Woolwich served with destroyers at Harwich in 1914 and then at Rosyth until the end of the war. She was with the First Destroyer Flotilla from at least July, 1914. In April 1916, she started also supporting the Thirteenth Destroyer Flotilla. She recommissioned at Devonport on 3 February, 1920. and was sold for breaking at Hayle on the 13th July 1926.